If you're a Facebook user, you know that Facebook updates their software to introduce new features that claim to improve your experience -- and they do it without warning. It's hard to find the time to study the details of the latest update, which leaves many of us perplexed when using Facebook. Sometimes the improvements are confusing, or just don't work. If you're like me, you just deal with it until you have time to roll up your sleeves and figure out a solution. 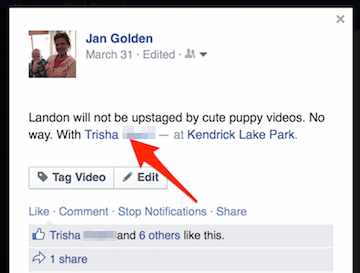 Here are six things that may frustrate you when using Facebook -- and how to fix them. I ran into a real friend of mine (not just a Facebook friend), whose first grandchild was born the previous week. When I asked her when the baby was due, she looked at me puzzled. Later that day, when I looked at her Facebook page, I saw multiple posts announcing the birth, also leaving me puzzled as to how I missed this news. 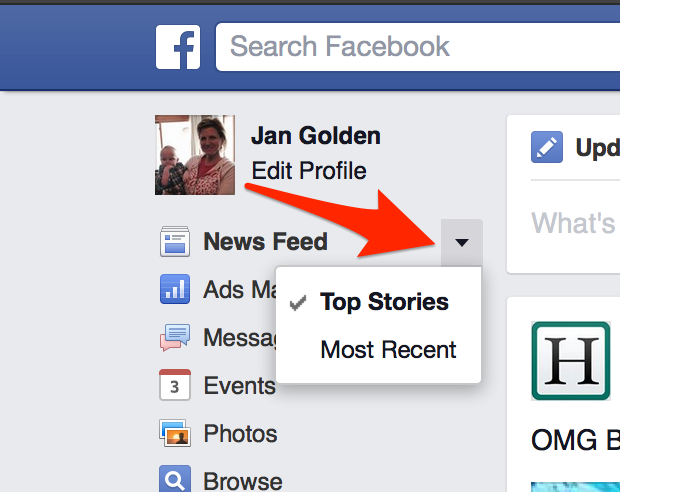 -- Facebook decides what you see in your newsfeed based on a "top secret" algorithm. -- You can change this setting to see 'Most Recent' posts rather than seeing "Popular" posts, which bypasses the algorithm. In Facebook on your computer, it's in the upper left corner under your picture. -- On your phone or tablet you see less posts from friends because Facebook prioritizes ads over personal content, which can also be the cause of missing updates from friends. If you're like me, you have a friend or two that are overzealous with sharing information on Facebook. Thanks to the Facebook algorithm, if you ever clicked on one of those links, you're going to see more and more similar posts. Fortunately, it's easy to tell Facebook what you'd like to see. 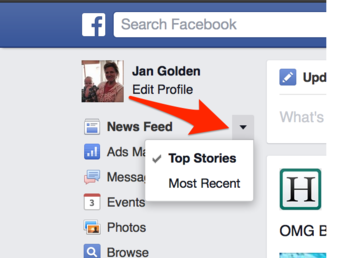 In the Facebook app, simply click the down arrow in the upper right corner of the post and select one of the options. I recently took an adorable video of my grandson at the park on a swing. I posted it to Facebook and later that day asked my daughter why she didn't comment. After she told me she didn't see it, I did some experimenting. -- Typing someone's name in the description or comments does not mean your post will appear in their timeline, even if you select their name. -- If you want the post to appear in someone's timeline, you must "tag" the person in the picture or video. -- Tagging can't be done in the Facebook app; you must login to the Facebook website to tag a person in a picture or video. When texting, I like to use emojis when that little extra nudge of emotion seems appropriate. But watch out for the smiley face symbol in Facebook. It is a "sticker", not an emoji, and it's HUGE. 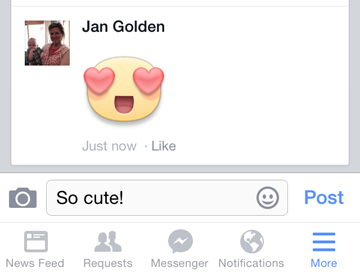 -- The sticker symbol appears in the comments or post section as a smiley face symbol, so it looks like an emoji. -- When you use a sticker, it doesn't post the text you type, it just posts the gigantic symbol. You don't realize what happened until after it is posted. 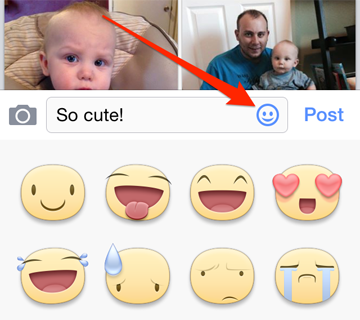 -- If you want to use the smaller emojis, use the set that are part of your keyboard. I turned off Facebook notifications to my email and text years ago, but recently when I joined a group, I started getting notifications again. 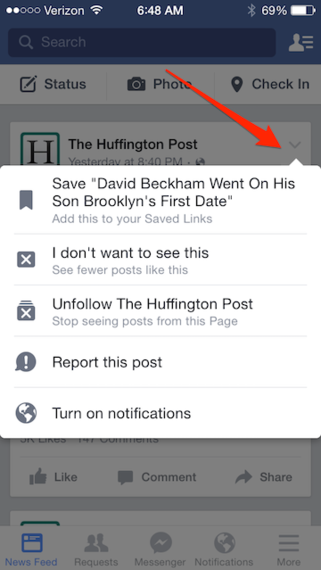 Here's how to turn off group notifications. -- Scroll down and select "Settings", then on the next screen, select "Notifications"
-- In the section titled "What Notifications You Get", select "Group posts"
-- Select the group you want and turn off "All Posts, any time members post in the group"
The makers of Candy Crush and other similar games use Facebook as an easy platform to spread the word about their game. In fact, in most games, you can advance if you invite friends to play. I don't get as many notifications inviting me to play Candy Crush as I used to, but when I do, it is irritating. Here is the best way to stop unwanted invitations from games and other apps. 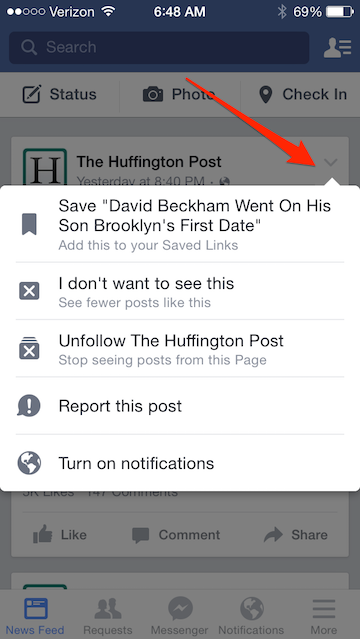 -- In the section titled "How You Get Notifications", select "Mobile Push"
-- Scroll down to the bottom and deselect "Application Invites"
Does Facebook have you pulling your hair out in frustration? I'm here to help. 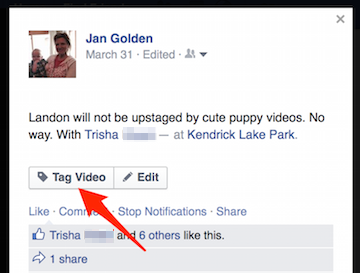 Share your Facebook frustrations in the comments, and I'll share my solutions with you! On <a href="http://instagr.am/" target="_hplink">Instagram</a> (iPhone and Android, free), users take photos from their daily lives and have the option to apply a variety of filters to enhance or touch-up their images. Users then have the ability to share their images on various social network sites as well as Instagram's own social network. Users also have the ability to "like" other users' photos and share with their own friends. BEST FOR: The application is best for those wanting to share the daily images of their lives. As Instagram has grown in popularity, many users can share their photos on multiple social networks. It's a great way to share your latest craft project or vacation adventures with your family and friends. TIPS & TRICKS: Photos from Instagram don't have to stay in the online realm. Users now have the ability to easily turn their filtered photos into actual photos on canvas using CanvasPop or even into desk calendars with the app Calendargram (iPhone, free), which would make great gifts for all of your loved ones.